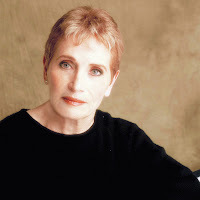 Multi-award winning author Pnina Moed-Kass has lived in Israel since 1968. 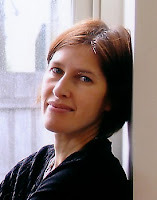 Her novel, Real Time (Clarion) was awarded the Sydney Taylor, the National Jewish Book Award, among others. The novel was also translated into German and French. Pnina is the author of a series of eight picture books about a snail, BERALE (Keter Publishing) which is available in the US and Israel, and a middle grade novel about an inquisitive dog which was published in Hebrew. Pnina frequently appear at community centers, schools, and libraries performing Berale stories. Her short stories (in English) have appeared in Cricket and the story "Five Words" appears in the Cricket anthology CELEBRATE. Pnina has toured the U.S. several times, speaking to adult and high school audiences. She also writes for various magazines, contributing book reviews and articles about the writing life and living in Israel. I’m glad she could take time out of her hectic schedule to respond to a few questions. How does the publication process differ for the American and Israeli market? Israel is a smaller country and access to publishers and agents is an easier process but the bottom line is the same - how good is what you've written. Other than books published in another country that have to be translated into Hebrew, all original material should be presented in Hebrew. I write my picture books and middle-grade novels in Hebrew. Tell me a little bit about your award-winning book, REAL TIME. REAL TIME is a fictional way to unravel all the strings in this small part of the world, strings that seem to be tied in a very tight knot. The strings are the stories of the various characters; these people relate the horror of the Holocaust, fighting a war, becoming a suicide bomber, starting a new life, solving the riddle of an old one. I describe hope, I tell about desperation - in the end I want my reader to have a gut understanding, to realize there are no easy solutions but that there are the good and the innocent living their lives here. What was your response to being honored by the Sydney Taylor Book Award Committee? The writer Cynthia Ozick once warned writers not to talk about ideas, unwritten stories, etc. - saying that all of it could vanish into thin air in the stream of spoken words (a loose rewording.) I'm working on several things, for different age groups, and of a different nature. I'm always working on something new, actually a few new things. Some peter out after the first paragraph, some go into cold storage, some fascinate me enough to keep me plugging at them, like a mouse gnawing at a piece of cheese. I'll try a poem, a script, a memoir - in short any genre that illuminates and brings life to the story. Like every occasion has its correct outfit, so does every idea have the "clothes" that suit it best. At the moment I'm working on a novel, a picture book, two middle-grade novels and some short stories; obviously not all at the same time though they all share one common denominator - words. Pnina, thanks for joining me and sharing your thoughts and ideas about writing books for childen. 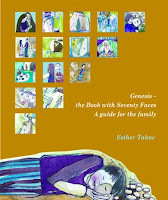 The Jewish Book Council has awarded the National Jewish Book Award for Jewish Family Literature to Genesis – the Book with Seventy Faces (Pitspopany, March 2008) by Esther Takac. 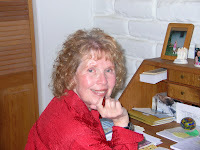 Esther is a psychologist and children's author. She is the author of Loni and the Moon, a children's book placed on the Victorian Premier's Reading List. She has studied Jewish texts for many years and presents workshops on Genesis. Genesis – the Book with Seventy Faces, is a remarkable book that appeals to parents, teachers, and students. I am happy to welcome Esther to my blog. Tell me about you book, Genesis – the Book with Seventy Faces. Genesis – the Book with Seventy Faces, is a storybook and guide to Genesis for the whole family. It is written in multiple layers and so invites kids and parents to read together and explore the richness and contemporary relevance of these stories and the commentaries written about them. Each page includes a retelling of the biblical story (with the corresponding chapter and verse references given) and layers of commentary drawn from traditional and modern interpretations, Midrash, Kabbalah and legend. Readers are encouraged to discuss the moral and philosophical issues raised, and so the book offers a way for families to connect around the Genesis text, showing how these stories reflect our own struggles and dilemmas. There is more source material and historical background provided for teenagers and adults in margin boxes, and each page has beautiful illustrations (I am very lucky to have worked with a talented illustrator and designer.) The book offers readers an insight into the rich and multi-layered approach of Judaism to texts, whilst allowing them to distinguish between Torah on the one hand and commentary on the other. References to all commentaries are given in the endnotes. My inspiration for this book came from my own children. I wanted them to be exposed to the depth, poetry and contemporary relevance I had discovered in the Genesis stories and commentaries. Through this book I wanted to give my children and children everywhere a taste of the richness of the Jewish tradition. So they would understand that the Torah really does have seventy faces – it is like a pass-the-parcel game: each time you unwrap a layer of paper, there is another layer with more secrets and meanings ready to be unwrapped. I wanted these stories, with their sense of mystery and wonder, their telling of things sacred, to seep into the minds and imaginations of our children, a rich resource to draw upon as they grow up. An enormous amount of research was involved! When I started the project I had no idea how much work I was getting myself into! To write the book I studied the Genesis Torah text, and then I read the widest range of commentaries on the text I could find – traditional Rabbinic commentary, Midrash, Jewish legend, Kabbalah, contemporary commentary from a range of approaches (literary, psychological, legal, feminist). My study at home was filled with volumes of books as I studied the different approaches to the stories and drew out the themes and issues to be focused on. What was the most interesting part of the process of writing the book? The process of writing the book was a fascinating one. It was my pleasure and privilege to spend many hours reading the works of our traditional and contemporary scholars, many of whose insights on Genesis, and life in general, I found to be full of wisdom, moving and inspiring. It was also very interesting to think about ways of conveying these different approaches, the concept of multiple meanings or seventy faces, to the reader, in ways that invite the reader to actively engage and struggle with the issues raised. Are you planning to write more books about Torah? Esther, congratulations on the success of Genesis – the Book with Seventy Faces. Thanks for visiting with me! Edith Tarbescu is the author of four children's books, including the award-winning picture book ANNUSHKA’S VOYAGE (Houghton Mifflin). She is also a playwright and has written ANNUSHKA’S VOYAGE into a play for young people. The play was performed at The Little Theatre, in Albuqueruqe, and was recently published by PlayScripts. Her latest play for adults, SUFFER QUEEN, was produced at the Algonquin Theatre, in New York, in August. She is an ex-New Yorker (born and bred in Brooklyn) who now resides in Albuquerque, New Mexico. She enjoys long walks with her dog, Sugar Bear, as well as traveling, including trips to New York, and is looking forward to writing more books and plays. Tell me about ANNUSHKA'S VOYAGE. ANNUSHKA’S VOYAGE is the story of two young Jewish girls who travel in steerage from Russia to Ellis Island, circa 1920. They are supposed to be reunited with their father who traveled to America a few years earlier. The journey is long, and there's a storm at sea. And after they arrive, Ellis Island is crowded, and they have to be examined before they can leave the island. Most of all, Anya and Tanya are worried Papa won't find them. I am first generation American. My mother came here from Russia, and my father came from Hungary. I took some of my mother's story about traveling to America and some of my father's story, put them in a "blender" and came up with the best possible story. I did a lot of research. I had only heard bits and pieces from my parents, mostly from my father, who was a natural storyteller. When Ellis Island Museum opened, I was living in Connecticut, and it was not difficult to travel to the museum, view the exhibits, talk to curators, etc. I did that a few times. I also asked the Curator of Oral History to read my manuscript and make corrections. He did that, which was very helpful. He also wrote a blurb for the back of the book. You have also created a play based on your book. Can you share a bit about that process? I'm working on a picture book biography as well as a picture book about Passover titled "The Passover Elves." I also completed a novel for adults titled WALL STREET WIVES. I plan to revise the main character, a stockbroker, by making him more likeable, especially in this economic environment. I was encouraged by several agents, so I'll get back to the drawing board. Edith, Thanks for visiting! Best of luck with all of your books.